We all know that the prices of everything — from gasoline, to groceries, to the grains & hops needed to make beer — are on the daily rise; nothing unique there. With the price of beer rising for the breweries, so it rises for the distributors and so on down the line to the bars and eventually you and I. 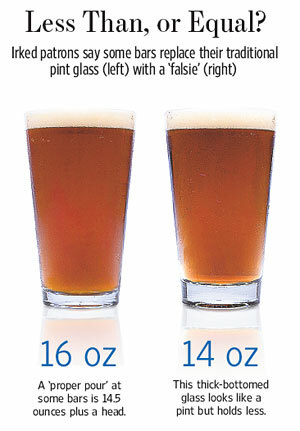 But is two ounces really that big a difference? Archie Gleason, director of marketing for Hooters — which has been noted as serving draft beer in 14-ounce glasses at franchised locations in Ohio, Indiana, Kentucky and Tennessee — claims “We can get 20 more beers out of a keg that way”. With the prices of kegs of beer going up at a nauseating pace, 20 extra beers per keg must go a long way. Many beer advocates are discussing developing stickers to adhere to the windows of bars and restaurants where pints live up to the name. And Oregon legislator Brian Clem is going so far as to take up the issue for the state’s 2009 budget, hoping to fund monitoring of beer portions by the state’s agriculture department. Can ask for a “top-off” after the foam on the profit pour settles. That’s what George Collentine did when he was served a beer with almost two inches of foam at an Italian restaurant this month. “I just waited,” says the 38-year-old chemical-company manager from Danbury, Conn. The bartender gave it to him. Have you been privy to any pint falsifying? Please let the readers know who to be aware of by leaving a comment!